ECDPM. 2010. African Regional and SubRegional Economic Integration Groupings and the Regional Economic Partnerships Agreement (EPA) Negotiations Configurations. Maastricht: European Centre for Development Policy Management. Overlapping memberships: African regional and sub-regional groupings. 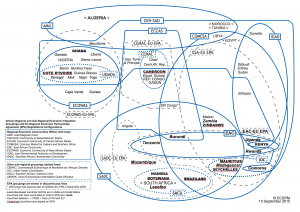 The diagram shows the spaghetti bowl of African regional integration agreements. 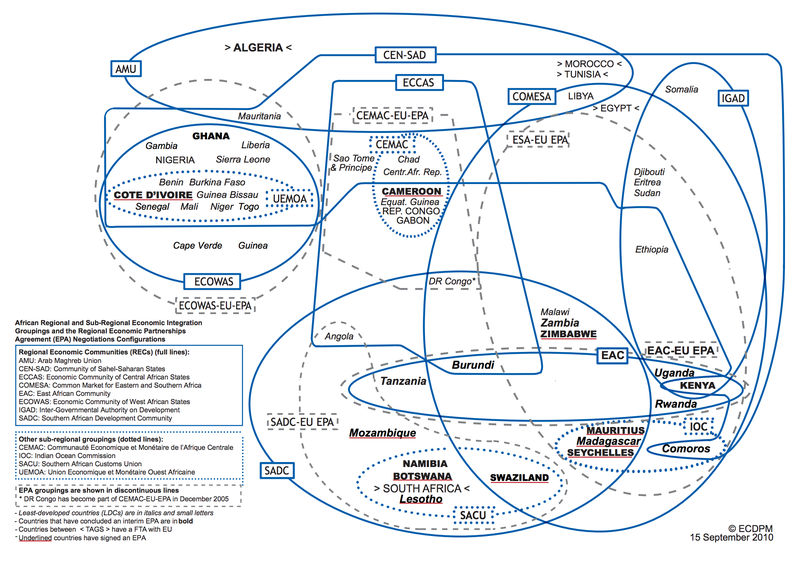 It illustrates the complexity of overlapping country memberships in multiple regional groupings. This is a major challenge in the implementation of commitments towards effective regional integration. Countries that have initialed or signed an Economic Partnership Agreement with Europe are in bold.